Data is the measuring stick of progress. Accurately assessing strength, monitoring progress over time and providing quantifiable improvement statistics has been an inexact science. 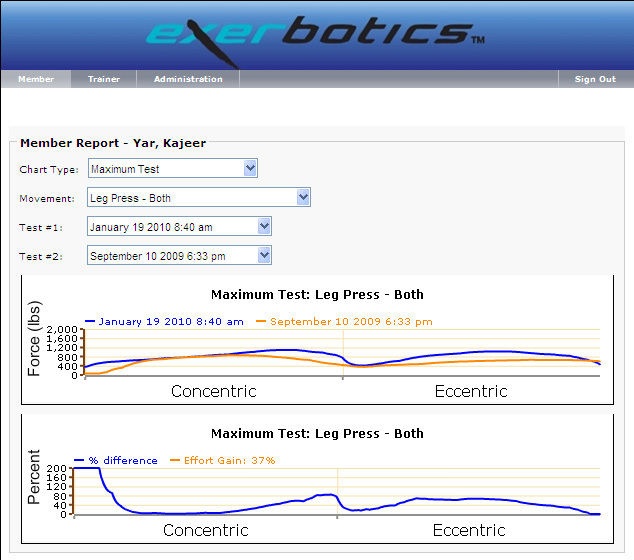 No matter what your training philosophies or methods are, Exerbotics gives you accurate, quantifiable data on pure muscle force. Through routine assessments you can quantify what is effective in your training or rehabilitation program. By creating a database of all your users, you have a resource to compare users based on circumstance, training methods, demographics or any other way you want to see the information. The information automatically recorded by your Exerbotics machines can be invaluable in demonstrating your commitment to results for your clients and examining where your programs are most effective or need modification.